As a new codec technology and new video compression standard, H.265/HEVC can compress video files to the half size with the same video quality as the original. It can also improve the video quality at the same bit rate. If you have got a box of Blu-ray discs and want to digitize them for backing up, converting Blu-ray to H.265 MP4 is a wise choice. And in this article, we will throw a quick tutorial on how to rip Blu-ray to H.265 MP4 video files. To achieve this goal, you will need a Blu-ray to H.265 converter. Here we highly recommend EaseFab LosslessCopy. Serving as an outstanding Blu-ray/DVD converter and ripper software designed with H.265 Encoder, this program enables users to convert Blu-rays to H.265 MP4 with 50% output size reduced and original quality kept. What's more, it has a built-in optimized profile bank which covers all the mainstream video formats MOV, MKV, FLV, M4V, WMV, MPG, 3GP, and popular devices iPad, iPhone, Galaxy Tab, Microsoft Surface RT/Pro and more. Thanks to the built-in video editor, you can personalize and retouch your videos in clicks. 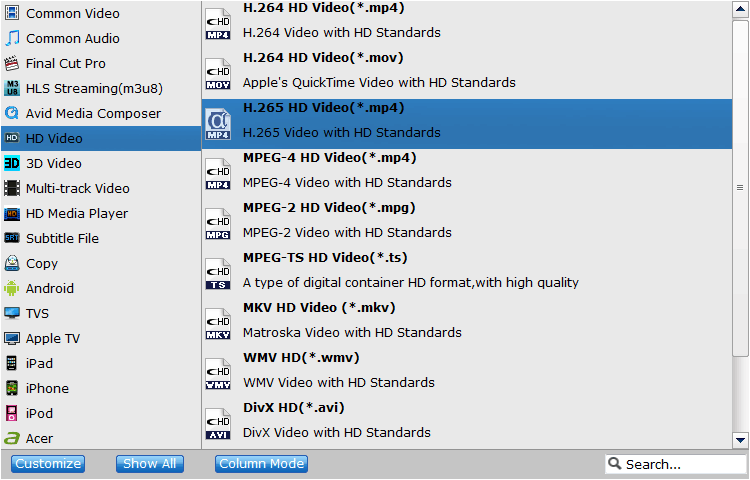 Download the program and learn how to rip and encode Blu-ray file to H.265 video.